"This bun is hiding something"
We spent about a week in the Marshall, Texas area checking out the local football teams, antique shops and libraries and everywhere we went we heard about the "Bubba Burger" at Fugler's Grocery and Market. First I heard their ad on the local radio and then someone who recognized me as Texas Bob. (With fame privacy is a thing of the past.) They recommended that I try out the infamous "Bubba Burger". We had other things to do. Everywhere I go I hear about the local elusive monster burger. It's sort of like trying to find "Big Foot". Everybody knows somebody who has actually seen it or had it. Regardless, they rarely live up to the local brag. On my last day in Marshall after watching a football game between East Texas Baptist University and Sul Ross State University at Ornelas Stadium and I decide to go in search of the "Bubba Burger" as an after game snack. ... In Search of the "Bubba Burger"
I got directions from Charlie Chitwood, the radio voice of the ETBU, that went something like this "Turn right in front of the stadium go out to the loop, turn right and then left on Hwy 154, like your going to Gilmer, Texas and go about 6 miles and tell him Charlie sent ya'." 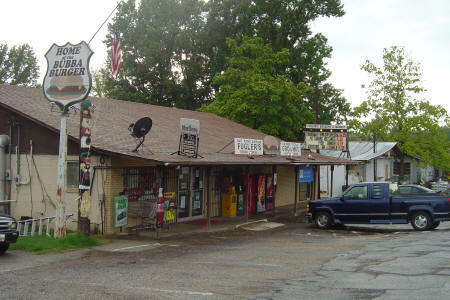 After at least one U-turn and driving through Nesbitt, Texas I found Fugler's on the left side of the road. 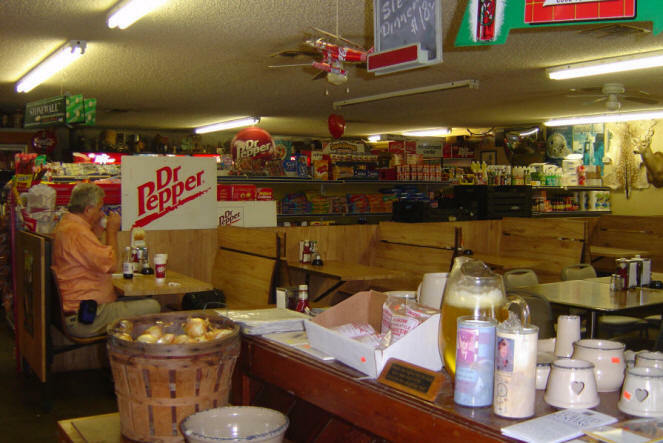 Fuglar's appeared to be typical Texas beer, bait and ammo kind of place. They seemed to sell everything. We sat down in the dining area, between the bushel baskets of sweet potatoes and the door way to the Laundromat. A pretty young girl brought us our menus and right there in the middle of the page was the "Bubba Burger." I knew we found the right place. 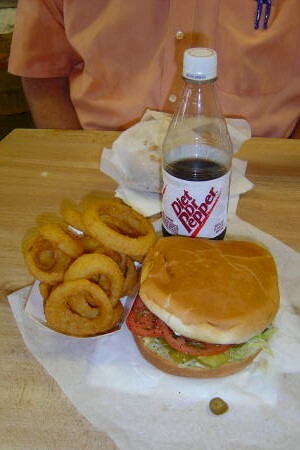 We ordered two "Bubba Burgers" with cheese, sliced jalapeños, one order of onion rings and two Dr Peppers. ... Discovery of the "Bubba Burger"
While we were waiting a customer came in and bought a 50 pound bag of Purina dog food, two steaks, and a roll of hemp rope. Then our waitress brought out our burgers. They were wrapped in a plain white wrapper. I thought, "nothing special, pretty plain." 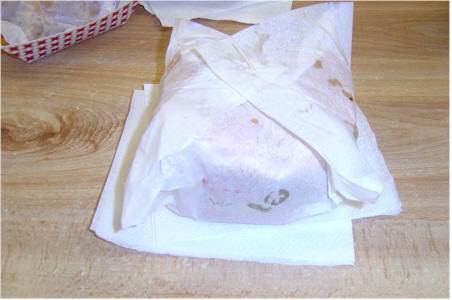 We unwrapped a burger and took our obligatory digital photograph and still I could see nothing special. That was before I found out what the bun was hiding. I took a big bite and realized that this meat patty was not measured in fractions! It must have weighed a pound at least. ...and it was good. After eating my burger I was glad we were sharing the onion rings. When I finished that burger I was no longer hungry. When I was checking out at the cash register I saw a jar of pickled boiled eggs labeled "boneless chicken diner.". I got so tickled that I forgot to leave our nice waitress a tip. So honey if you ever get to read this I owe you a tip for your good service. The next time you see Charlie Chitwood, he will make it good for me.